The first photo I took of Rudi in Bakersfield, CA at the Orange Grove RV park. The original rescuer had put this harness on him. Here’s a little background on Rudi and how he came into my life. I checked in to the Orange Grove RV Park in Bakersfield, CA on Sunday afternoon of April 9, 2017. Behind the desk is a Chihuahua mix on a blanket and I comment what a cute pup. The Manager of the park tells me the dog has been there 2 days and was picked up on a busy farming road nearby. The RV park is literally in the middle of orange groves, nice setting on a very busy highway and near a busy train track. The manager tells me that they will have the County Shelter pick the dog up on Monday morning. So I say “I’ll take the pup for a walk and see how he does”, the rest is history as they say. I do some research online and find 2 shelters in the area, City and County. Both have photos of dogs that have been there only a week, that is telling because what it means is that dogs don’t stay around and I know that dogs don’t get adopted that fast, anywhere, so it means they are euthanizing for space. I put Rudi and my dogs in the car and drove around the immediate area. Rudi was visibly nervous about being in the car. He would not even look out of the windows. He seemed terrified. Rudi spent the night, stayed in his bed after he ate some chicken stew that I had made for my 2 dogs, Mick & Romeo. I did not want to stay another night in Bakersfield! I had decided to take him with me if I could make sure that there was not a family looking for him. 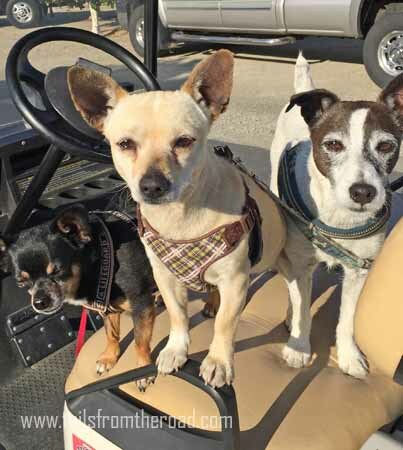 The RV park says they get dogs dumped every week there and when a neighbor does loose a dog, they come to the RV park because the RV park is the only business in the area. No one came looking for him. I called a Rescue organization the next morning and I got an ear full of bad news in Bakersfield if you are a homeless dog. The lady said that the City shelter would not even take a Chihuahua mix and both shelters euthanized for space weekly, they are just too busy. She said “you would be doing the dog a great deed if you drove away with him”. So we loaded up the motorhome and hit the road, hoping this little fellow would be okay in a moving house. I headed north to Coarsegold where the Park of the Sierra’s Escapee RV park is, a beautiful park and full of always friendly Escapees! If you don’t know me, I’m a Certified Professional Dog Trainer, CPDT- KA, the KA stands for knowledge assessed. I taught many dog training classes in Durango, CO, spent thousands of dollars and hours on my education, but where all that knowledge jelled in my head was pet sitting. Each day for 5 years I had 6-10 dogs in my house, I took them out for daily, off-leash hikes and they lived with me. This helped me see hundreds of dogs, different breeds, different personalities, fears, motivations and so much more. I feel like this time was the “Harvard” of my life. So I’m going to write new posts every few days on training and behavior and how Rudi adapts to living with people as opposed to just living around people. My hope is that you will find a tip or two to help you with your dogs or others. 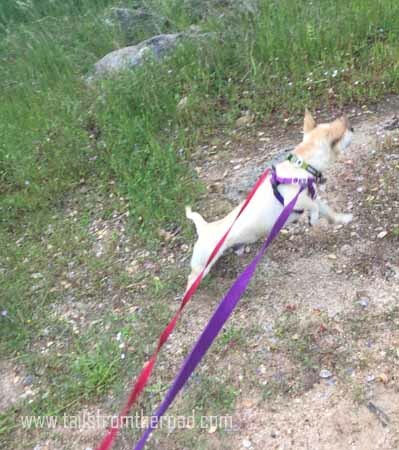 Rudi being totally wild on the leash, seeing birds in the wild. It was a good drive to Coarsegold, CA, I the foothills of the Sierras. Green grass and big beautiful trees. Rudi stayed quiet in the motorhome dog seat the whole time. At one point he started panting, looking kind of nervous which made me nervous, but then he calmed himself and went back to resting. We made 1 stop at a rest area. My #1 concern right now is not losing Rudi. I am lax with my 2 dogs in my protocols, they have great recalls and will not run from me, and so if I drop a leash, it’s no big deal. So I am reminding myself to be mindful of open doors and leash protocols. I put a Ruffwear harness on Rudi in addition to a collar with one of my dog’s information tag. We took a good walk at the Park of the Sierra RV park I the afternoon. I realize that the harness is turning this dog into a sled dog. So I find one of Mick’s old Freedom harnesses. This has a hook on the front and the back. This will be better for tomorrow. No value for humans – meaning Rudi has lived around humans, but doesn’t look to humans for decision making or think them as value to his day. Like us, dogs are thinking “what’s in this for me”. Solution: front clip harness and work on calling him to give his attention to me, treat! Creating VALUE with your dog is the most important thing you can do for your relationship and the happiness of dog and human. People think that because they put dry kibble in a bowl twice a day that their dog will think they are the holy grail, I can guarantee it takes a lot more effort than this. #1 is to be clear and consistent with your communications. Don’t let the dog get on the couch the first week, only to yell at him the 2nd week every day to tell him to get off of the couch. Be clear with what you are asking. And this doesn’t mean saying the word such as “sit” 10 times. If the dog doesn’t know sit, then saying it 10 times won’t help. Luring the dog with a treat on his nose into a sit, delivering the treat when the dog is sitting will help the dog know that is the position you are asking for. And if you did this 5 times in the kitchen, you will need to do it in every room of the house, inside and outside, everywhere you take the dog, helping him understand what a “sit” truly is. Dogs don’t generalize like we to, so just because your dog sits in the kitchen for a treat, doesn’t mean your dog knows to sit in the park. Every dog trainer has heard this a thousand times “he knows it, but just won’t do it outside”. The real truth is that the dog doesn’t know it well enough to do it outside, or might have anxiety over it because the human is getting mad, or is nervous about something in the environment that he just can’t do it there. It’s not that the dog is just defiant, generally they want to please you, but you must help them be successful. So if your dog can perform something in a different environment from which he was taught in, go back to square 1 and teach him like you did the first time. Repeat, repeat, fading out the food lure and rewarding the behavior when it is performed. 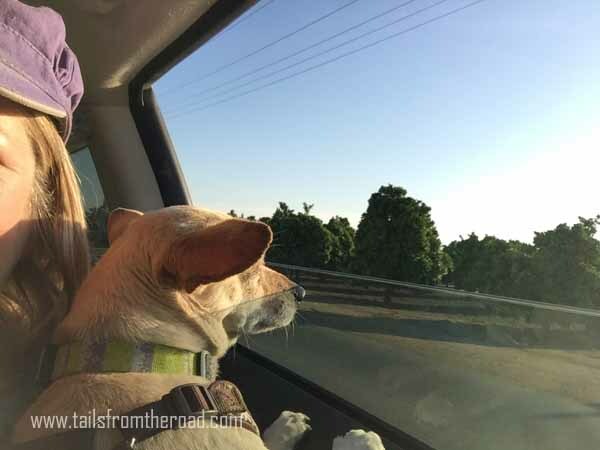 Keep on reading about Rudi’s progress from a street dog to a RVing travel dog. Juliet, I love how you explain what the dog is thinking – it makes it so basic, yet is always a fresh reminder that we as humans can’t assume our dogs think just like us! Sully is getting a refresher course this week, thanks to your writing! My mission is always to try to think “how is it for the dog”. One of my favorite writers, Suzanne Clothier always says this.